Everett & Ella invent TubeBall, a new puppy game. It's a little hard to explain because the rules keep changing depending on who has the ball. Fergo, my friend, you know how much I love you, I say to this handsome black dog. Just because you're you. But the old fella just looks up at me with those soulful brown eyes. Eyes that have seen puppy after puppy pass through his puppy raisers' home. Eyes that have known love and can return deep affection without a word being said. Eyes that are now looking deep into my own and saying "Cookie?" He nudges my right front jeans pocket. The magic place that dog treats come from. Alright, you handsome fella. I have to give in to his sweetness. There's just nothing else to be done about it. Just one. I need the rest for Euka's training today. Fergo and I, we're old friends. 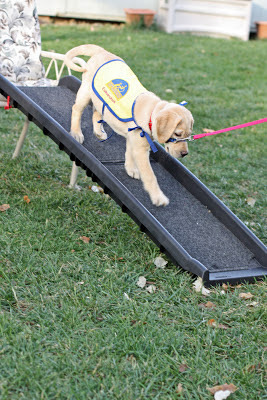 A CCI release dog and beloved pet of Emma's puppy raisers. We once took Fergo on a vacation road trip with us (see Ten Ten in Penn) when his folk needed a puppy sitter for a week. You know, nothing is as bonding as traveling in an RV together. After a solid week of shared residence in a six wheeled rolling house, everyone inside has experienced, and shared, the complete toolbox of emotions. And have revealed all hidden personality traits. Ah, but Fergo was a doll the entire road trip, the best dog in the house. I do love this big sweetie. But today's about working with the E's and exposing them to different experiences. The dog treats in my pocket are currency to pay the young Euka for a job well done. I'm hoping to be broke by the end of the afternoon. 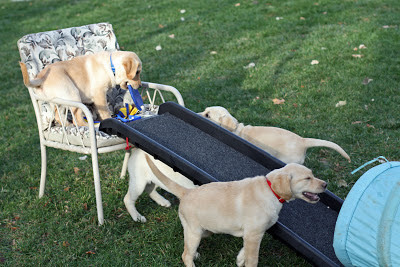 Along with Euka, we have littermates Everett, Ella and Emma. 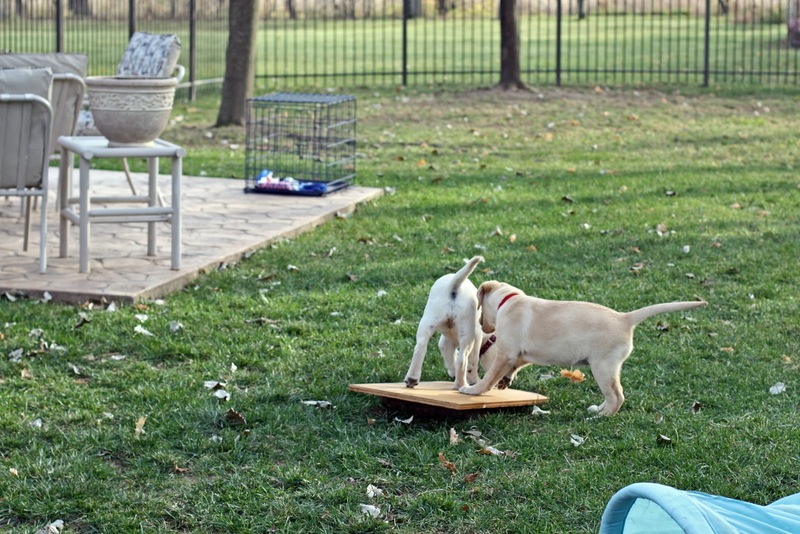 A few minutes of playtime is an excellent idea to get some of the puppy heebie jeebies out. Run puppies! Run!, we encourage. As if they need it. A handful of dog lovin' neighbors pop by with their kids to help with socialization. Well, so far so good. Easy peasie. Ok, now it's time to psych ourselves and get down to business here. Put on your working faces puppies, this is serious stuff now. Many of the training stations are similar to the experiences the E's had with their breeder caretaker and so won't be the first time they seen such things. But repeated positive experiences as their growing puppy brains develop will help them as they continue to encounter the new and different that crosses their path. 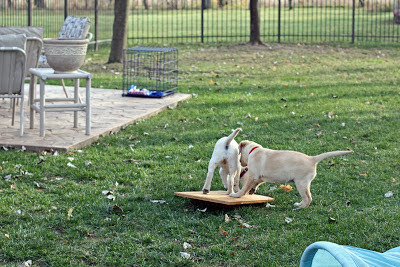 On the left, Euka and Emma are walking on a wobble board. As working dogs, they'll be asked to walk across different surfaces. 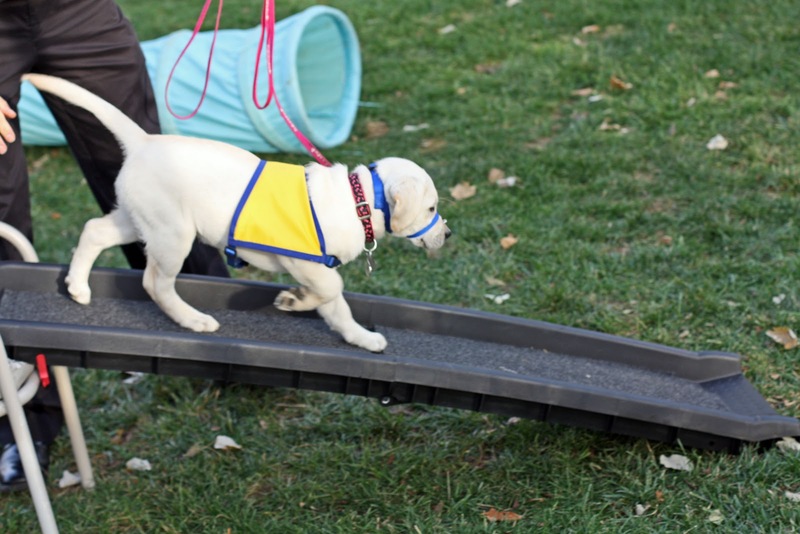 A service dog can't try to avoid or move around an unfamiliar surface, so confidence here is a requirement. The photo at the top of the post has Everett and Ella in a tube during playtime. As a training exercise we put the pups in a Sit/Stay at one end, then called them through to the other. An enclosed environment is another situation that we want them to be comfortable with. Think about air travel; there's not much room at the feet of an individual traveling with their service dog by airplane. That's indeed some tight quarters in the cabin, for both man and beast, so we want the pups to know that it's still safe when in a space that surrounds their body. Moving along, we reach the ramp station. Can the pups accept this surface, one that will have them exposed above the ground? Everett says it's a cake walk. He doesn't just strut up the thing, but does it with a frisbee in his mouth, the little show-off. C'mon girls, he taunts. Bet ya a dog cookie you can't get me up here! Hey you girly girls! I got the frisbee and you don't! Emma has a look on her face like, I'm gonna pound him. The girls, of course, rise to the challenge of their brother. He is in possession of the frisbee, after all. And that just won't do. Ella is next up the ramp, giving the thing a close inspection before she makes it to the apex so she can smear her brother and claim her victory prize. 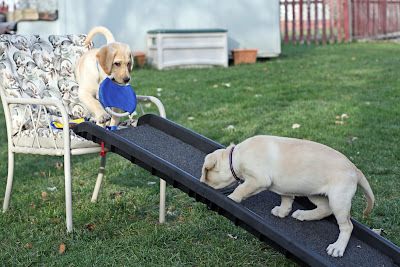 We clear the deck chair of the distraction of now rastlin' puppies and give Euka her chance to explore. And the usually fearless Euka surprised us by needing some encouragement. We tried with a dog cookie a couple of times, but it wasn't until Everett came tearing back up the slide (Comin' through! he yells) that she found her motivation. Yep, the spirit of competition. 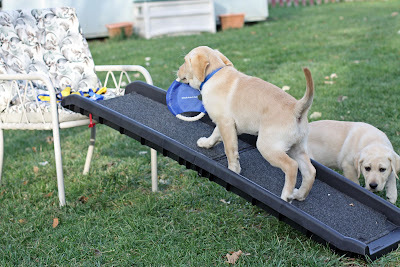 With Everett standing at the top, wagging his tail, Euka looks at him with a Like heck you are expression and charges to the top to pound him. Aw, this ain't nuthin', says Euka. Try to gimme a challenge next time. Emma has at it like she's done this all before, too. Well done, little pups! And with a renewed sense of purpose and control, we then move on to a photo shoot of the four to bring their first training class to a successful close. Wanna take a guess? 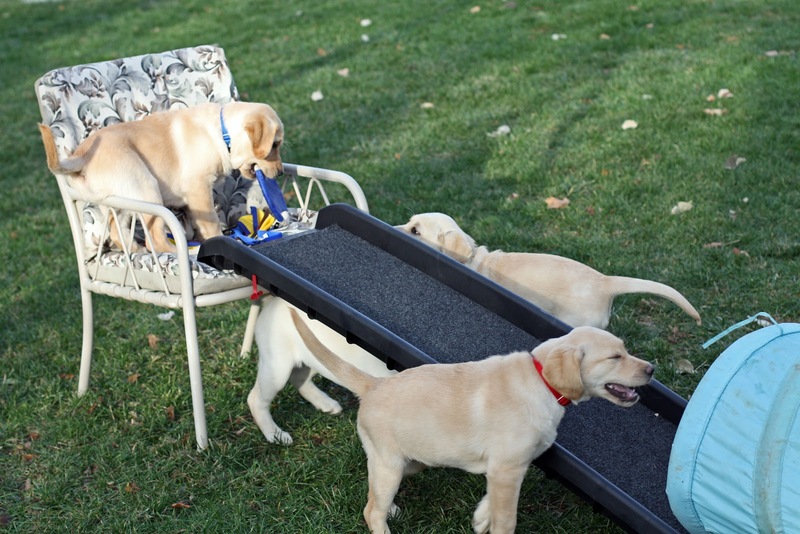 How many puppy raisers does it take to get four eleven-week-old puppies to sit nicely on a lawn swing. Ha ha, y'all. No, it's not twenty, but thanks for thanking that. Actually, I'm not gonna tell you because it's too embarrassing. But I will admit that Fergo was a huge help as a photographer's assistant. The big sweetie. Fergo helps to set up the E's for their photo shoot. Love this update. I knew they would do great! This info and the photos make me smile and warms my heart...thank you. Thanks for your kind words. The four of them are indeed doing well and we're so very proud of them. Their time at the breeder caretaker gave them a good foundation for us to build on. It makes this early training go smoother when they're not seeing some things for the first time. Thanks CD! 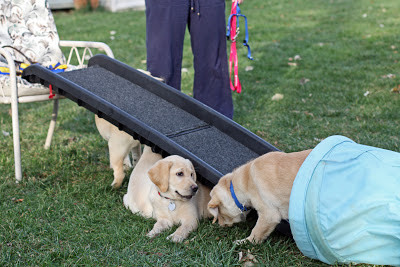 You know, it's a big help to have experienced puppies raisers in our training group. I was just thinking, between three of us we've raised 27 puppies. Our fourth PR is a first timer. For me, a few things are now second nature, but other things have me looking to my fellow PR's for advise. It works well. 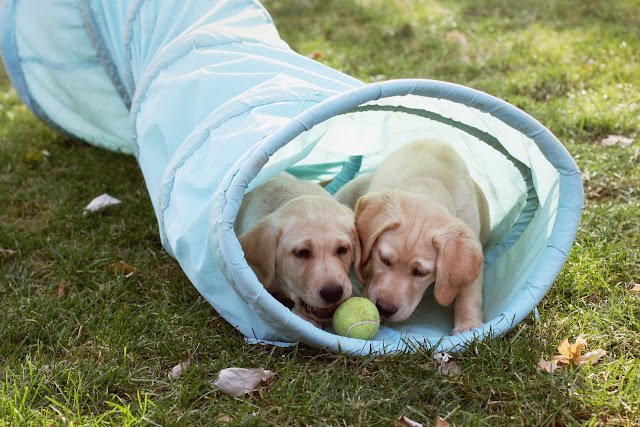 It was cute to see them playing in the tube. What I don't have photos of is when there were two in the tube, then getting jumped by the other two from the outside. They would all go twisting and rolling. Super cute. Wordless Wednesday: A dozen, give or take.